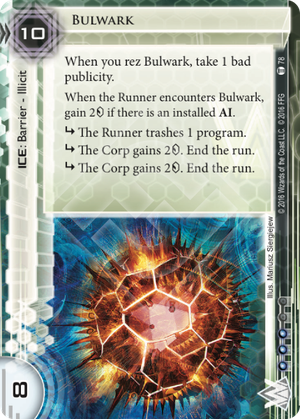 When the Runner encounters Bulwark, gain 2credit if there is an installed AI. subroutine The Runner trashes 1 program. subroutine The Corp gains 2credit. End the run. Another big barrier. I won't compare to others like Heimdall 2.0, Data Ward, or Wotan as these are all somewhat porous. This ICE, like Curtain Wall and Hadrian's Wall straight up end the run unless you break the subroutines or bypass the ICE entirely. Curtain Wall will typically cost 2 more to get through, so long as it is the outermost piece of ICE but costs 4 more to rez. Bulwark and Hadrain's Wall cost the same to rez but Bulwark will typically cost 2 more to break. So Bulwark seems to be a better deal than either in most circumstances. But wait! This doesn't even take into consideration the on encounter effect and the fact that this barrier has a bite to it. Gaining 2 each time the runner encounters Bulwark with an AI installed can certainly add up quickly. Of course, in many games, this won't come into play at all, but it certainly is a point in Bulwark's favor. Now onto the bite. Bulwark's first subroutine: The Runner trashes 1 program. Not counting Orion or Markus 1.0, this is only the second barrier that can trash a program. Galahad is the other, but of course it needs support and the grail suite costs a pretty penny in influence. This is pretty huge. True, the runner picks the program, but losing any program is usually a big hit. Early game, the runner may have their killer installed and nothing else. A facecheck on Bulwark? Goodbye killer. With DNA Tracker and now Bulwark, runners are going to have more trouble early game. They take a risk running without all three Icebreakers or a decent AI installed (or a Self-modifying Code and a ton of credits). The last little point in Bulwark's favor is the little bonus you'll get when the runner facechecks Bulwark unprepared (maybe a Marcus Batty combo can trigger it again). The Corp gains 2 . End the run. INSTANT 20% REBATE!!! Now onto the negative. Bulwark joins the cast of only six other Illicit ICE. Most aren't used too often as the ICE isn't good enough to warrant the bad publicity. Bulwark absolutely is in my opinion. Write an Exposé or two if you are worried about the BP. In closing; I'm surprised that this ICE isn't a Destroyer. If it was, at least Sharpshooter could save the wary runner. But no. At first I thought that it was because the subroutine lets the runner choose the program to trash. But I checked, and Burke Bugs which has a similar subroutine, is labeled a Destroyer. It seems like an oversight to me, but perhaps not. A good benchmark to compare Bulwark with is Hadrian's Wall. The strength of Hadrian's is in its sheer stopping power. However, the Runner can choose to just End the Run, set you back 10 credits and start targeting other servers. Bulwark has that same stopping power, but it also sets the Runner back. This is the biggest advantage that Bulwark has over Hadrian's Wall or Curtain Wall - the Runner will definitely lose something for it. Of course, it comes with a cost of taking 1 bad pub. Bad pub comes back to haunt you the longer the game drags on. Fortunately Bulwark does something which counteracts this - create an opening to score a solid 3/2 or even 5/3.